Sticky Lemon Sticky Buns. These soft and fluffy buns are filled with a lemon sugar butter filling and then drizzled with a simple lemon sugar icing. 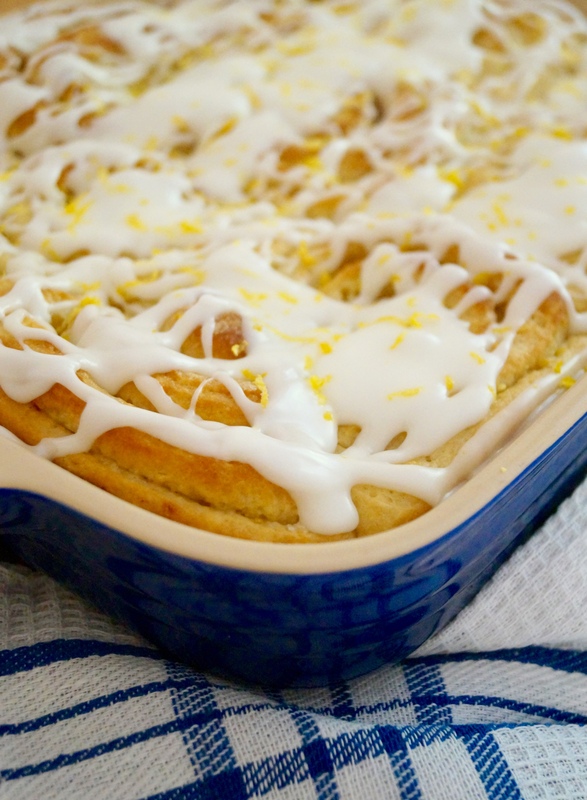 Lemon sticky buns are my idea of the perfect weekend breakfast. What’s not to just love about a soft, buttery bun bursting with tangy lemony flavour and drizzled with sticky lemon icing? 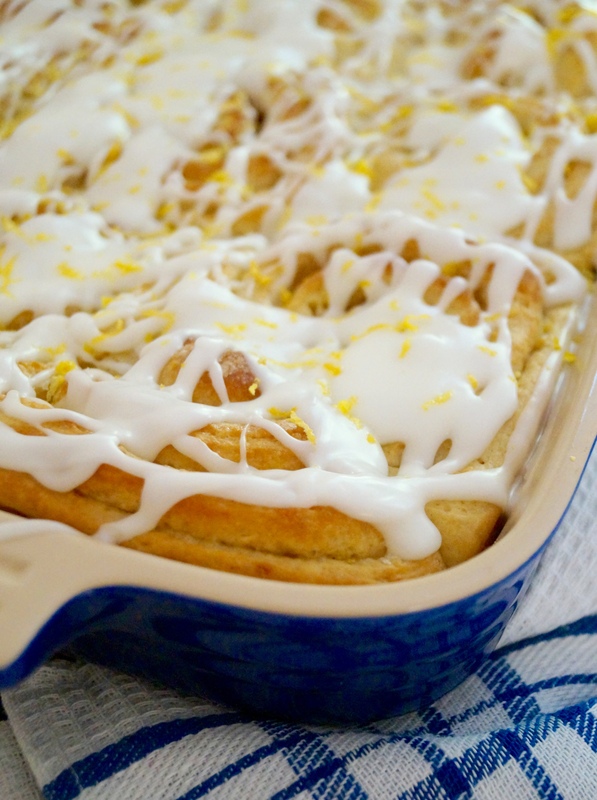 As much as I like cinnamon rolls, these lemon sticky buns will always be my top pick. Making the dough is really simple and straightforward. Mix together flour, sugar, yeast, lemon zest and softened butter. When mixed through add the wet ingredients (warm milk and an egg) and knead until soft and elasticated. Leave the dough in a bowl, cover it and then allow to rise until doubled in size. Once the dough has risen fully, roll it out and spread with homemade lemon sugar butter and then roll up and cut into the rolls. Place in a buttered dish and allow to rise again until joined up. Then all that’s left to do bake the buns until they’re nicely golden! Your kitchen will be filled with the most gorgeous fragrant lemony aroma! As soon as these buns leave the oven you will be dying to dig in and try one straight away! But, hold on as the best part comes next. The glaze is sweet, sticky and packed with zingy lemon flavour. Sprinkle with extra lemon zest if you like and enjoy! You won’t be able to resist these! If you like lemon desserts then this recipe is one for you to try. 1. To make the dough: In a large stand mixer, add the flour, yeast, sugar and the zest. Mix gently on low speed just to combine. Then add the butter and rub in fully, until no lumps of butter remain. Now gently heat the milk in a small saucepan until it’s just warm and you can still poke your finger in without it burning. Then on a low speed, gently pour the milk in and add the egg, mix until a soft and sticky dough comes together. Then knead for another 5-7 minutes or until you have a soft and well elasticated dough. Now remove the dough from the mixer and knead gently on a board for about a minute just to bring it together into a ball. Place back in the bowl, cover fully with cling film and then leave somewhere warm for 1-2 hours or until it’s doubled in size. 2. To make the lemon filling: Roll the dough out on a flour surface to roughly 20cm x 50cm. Then for the filling melt the butter gently, then add the sugar and stir to dissolve. Add the zest and then brush this mixture all over the rolled out dough. Roll the dough up from one of the longest sides. Then divide into 12 equally sized rolls. Now lightly grease a large baking dish with a little butter. Place the rolls in the greased tin, making sure they’re well spread out. Then cover with cling film (plastic wrap) and leave in a warm place for 45 minutes or until they’ve joined up and doubled in size. 3.To bake: Preheat your oven to 180°C / 160°C Fan / 350°F / Gas Mark 4. Bake the buns for 20-25 minutes, until they’re lightly golden. They may need a few minutes longer in different ovens and should sound hollow when tapped. Allow to cool completely to room temperature in the baking dish. For the icing, just combine the icing sugar and lemon juice, mix until you have a smooth and drizzling consistency. Then drizzle all over the baked buns. Finish with extra lemon zest before allowing the icing to set. Buns will store in an airtight container for up to 3 days. Sticky buns make life worth living if you ask me. Oh wow, these look good. You are so right. When it’s winter I always wanna eat something summer-like. Like lemon. Are you sure you don’t own a bakery? Or maybe your parents do? ‘Coz what comes out of your kitchen are nothing short of ah-mazing! Like these buns! This one is bookmarked, to be tried when the weather warms. Like you said, would be perfect for breakfast in the sun. Thanks for bringing these to the Fiesta! Oh yum Jess! You are making me VERY hungry! These look delicious! LOVE sticky buns. These look so good… and I’m sitting here on a Saturday morning starting at your photos… and I may or may not have started drooling, hahaha. Need right now! What a work of art; pastry art, that is. 🙂 These look and sound amazing, any time of year. Love the lemon here. So original! You had me at triple lemon – these look AMAZING. Jess these looks crazy delicious! Jess, these are so pretty! You’re so talented!! I’m charmed by all the scrumptious lemon in the Sticky Buns! Lemon sweets are my favorite! wow! I could wolf down a few of these in a heartbeat! Gorgeous! 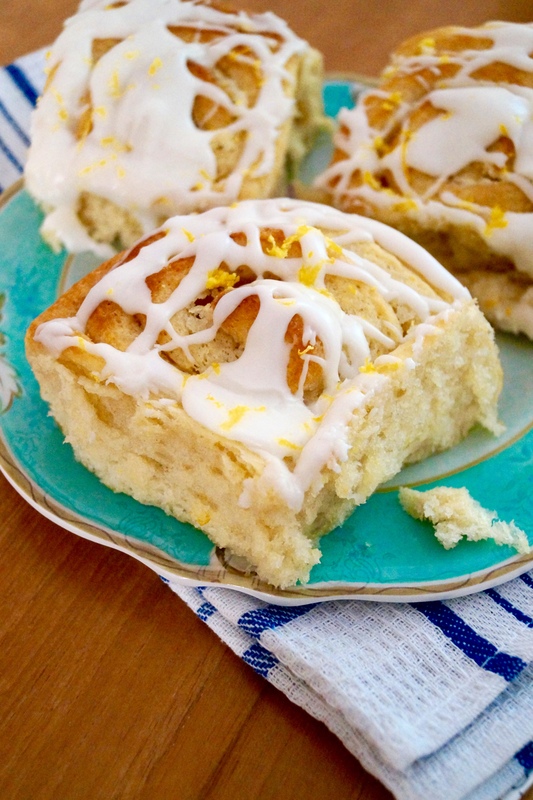 Oh Jess, these are glorious, I love the soft yeast rolls and really love your addition of lemon. They look pillowy soft and so delicious! Ooh, what a great sweet treat! These look divine! I am such a fan of sticky buns (I think I’ve posted two recipes of my own so far!) but I am yet to try lemon… may have to add these to the “to bake” list! Yum! I haven’t had sticky buns since I was little. This is so nostalgic! I love all kinds of rolls/buns! The lemon flavor is perfect for it! Looks so good Jessica! woah…these look seriously delicious! I love the addition of the lemon filling. Can’t wait to give them a shot! I am crazy for sticky buns…Although I usually eat the ones topped with pecans, I’ll have to try these ones… I can imagine how aromatic these lemon sticky buns are. ohhh gosh drooling and want to make NOW! I will! I just need some house guest to make it for. I fear if I made it now… id eat them all! I am drooling over these Jessica! Obsessed with all things lemon, these sound divine! You know what I love! Citrus is just perfect during the winter. These buns look so delicious! Jessica, these look great! I would love to be eating one of these, and dreaming about summer right about now. What I wouldn’t give to have woken up to these this morning! I love tart-sweet treats. Gosh. I’m a sucker for any kind of bakery sweet roll like this. Yours look so delicious 🙂 Glad I found your blog today – so much good stuff on here! These look AMAZING, I’d love to give them a try! Only one problem, I don’t have a stand mixer and being a uni student means I don’t really have the budget to buy one – is there any way to do this by hand or does it need to be machine mixed? Thanks!